If you live in Canada you know that 2017 is Canada’s 150th Birthday, and I think one of the best ways to celebrate our amazing country is to go camping, but not just your usual camping trip. To fully embrace what makes Canada so special, invite someone who has never camped before to join you on your next camping trip and introduce them to one of Canada’s best features – the wilderness! Over the past couple of years every time my daughter and I were getting set for a weekend camping trip, one of my friends would mention that she would love to try camping. She didn’t grow up in Canada and hadn’t had a chance as a kid to experience camping. This summer our schedules finally worked out and my friend and her daughter joined us for their first time ever camping adventure. 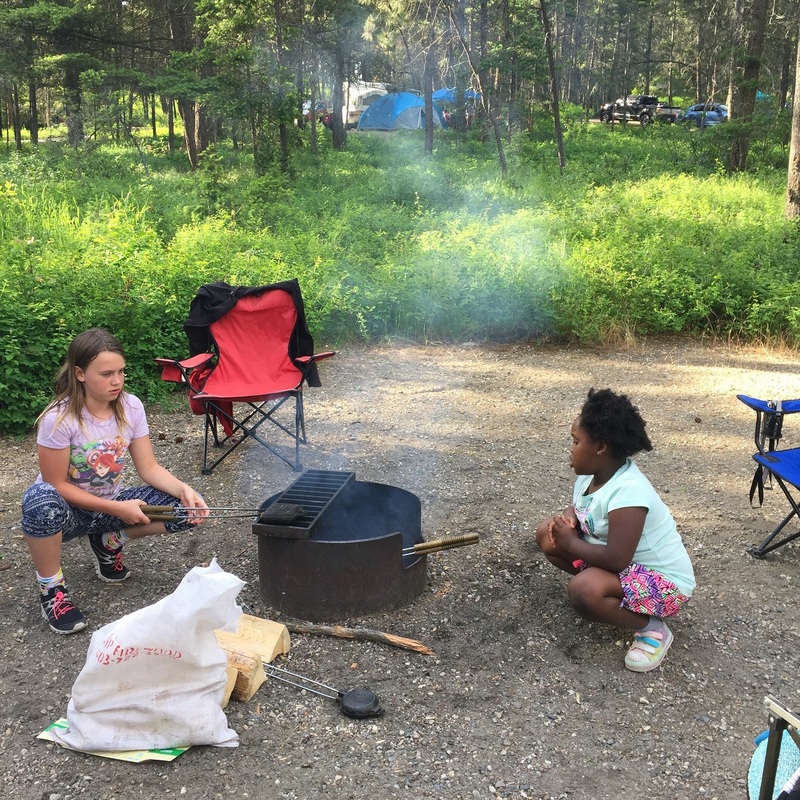 Both families learned a lot over the weekend and here are my top 5 tips to make an intro to a camping trip a success. We decided that our guests would join us on Saturday morning and spend the day and one night at the site. One night is a great way to get a good feel for camping but not too overwhelming for new campers. List everything from sleeping gear to clothes that they will require including extras like sunscreen and bug spray. Have your new camper check out the list and let you know what they need to borrow. For our trip, we supplied all the camping gear (tent, stove, dishes, etc) and also ended up bringing an extra inflatable mattress for them. We booked the weekend at Ellison Provincial Park in the Okanagan which is a great site for new campers. Ellison Provincial Park has flush toilets, running water, a beach, mountains, playground for the kids, and nature trails which all gave a great first impression. It’s also full of families and different camper set ups – everything from the small single tent to luxury RVs and everything in between. One of the interesting things I learned over the weekend was about the perception of camping. It wasn’t that they didn’t have equipment or access to equipment, it’s that for my friends (and likely many others as well) they had the impression that camping is about driving way into the woods, clearing your own site and being totally isolated from civilization. While some camping is like that, having access to reserveable spots at Provincial Parks and local campgrounds really opens up the camping world to newcomers, which is less overwhelming and scary! Don’t turn off new campers by making elaborate Pinterest worthy meals that also require endless hours of clean up! Go classic, s’mores, hotdogs on sticks over the campfire, simple bacon and eggs for breakfast. Try and mix campfire and camp stove cooking as well. We decided to make pizzas using Pie Irons for dinner but didn’t get the fire going far enough in advance so I ended up constantly trying to get the fire relit, getting some coals going, and supervising the use of the pie irons….in hindsight I should have just followed my own advice and kept it simple and planned to do hot dogs over the fire for dinner. My new little camping buddy agreed – she wondered why we didn’t have hot dogs! Everything from how reservations at the park work, to how to use the stove, to what kind of bug/bird/rock/animal is that! The adage “no question is a bad question” is very true in this situation. The Park Rangers and operators are your best resource. When you check in, think of all the questions that your new campers might ask and get the answers ahead of time. While you are chatting with the Ranger make sure you pick up a copy of Jerry’s Scavenger hunt for the kids to do as well. It’s an amazing tool to fight any boredom that your camping kids might have, plus they receive a cool souvenir pin when they complete it. Then just go with the flow. Set some boundaries for the kids, get out some snacks, settle into the camp chairs and let the kids adventure while the adults get a true taste of why camping is so great. Sit back, relax, listen to the birds and the sounds of kids exploring, and just enjoy Canada. To locate campgrounds in BC go to Where to Camp at Camping & RVing BC. Post your BC camping and travel photos on #campinbc. Heather was born and raised in the Kootenay region of BC and grew up camping, canoeing, skiing, beginning her career in the ski tourism industry. Life took her to Alberta and after being away from BC for ten years she and her family are back and looking forward to exploring BC - revisiting old favourites and discovering new ones. Heather is a mom, Girl Guide leader and community volunteer in her new home town of Kelowna. 0 thoughts on "5 Great Tips for the New Camper in British Columbia"